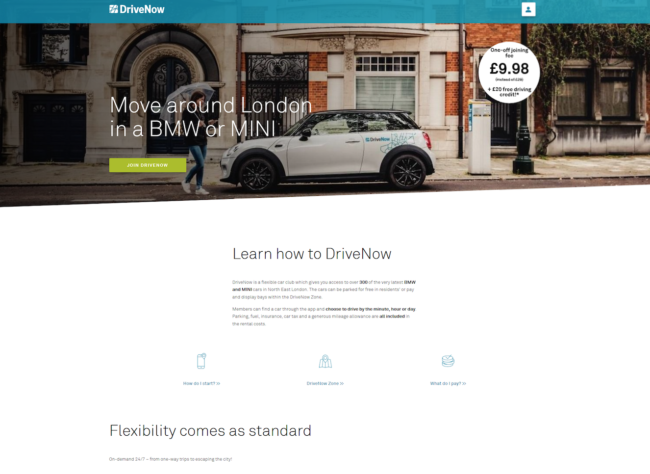 DriveNow is like Boris bikes for cars, providing BMW and MINI cars to rent on a pay as you go basis. There are 4 areas where you can find Drive Now cars: Haringey, Hackney, Islington and Waltham Forest. You will first have to register on the DriveNow website and then use the free mobile application to find a car close to you. You can book a car online up to 15 minutes prior your rental or rent any available DriveNow car you find locally. The best part is that after you have registered, you don’t need to wait for your DriveNow Customer Card to be sent to you. You can instantly use the customer ID that you will find in the confirmation email which you can use to open vehicles directly via the App. Register to use for £9.98 (instead of £29) and get £20 free driving credit which is equivalent to 60 minutes! Munich, Berlin, Hamburg, Cologne and Dusseldorf, Vienna, London, Milan, Brussels, Stockholm, Copenhagen, Lisbon and Helsinki. It provides an easy a convenient way to travel in the city. You just use the DriveNow App to locate and reserve a car nearby, you open it with your App and you are ready to go. Go back to Cheap Car Rental category to find more websites and organisations offering cheap car rental and car sharing services.